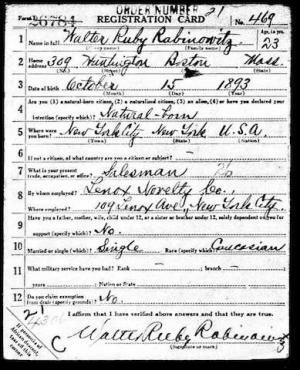 When and why did Walter Rabinowitz take on our abbreviated surname Ruby? He was 23 years old in 1917, and his world was about to be transformed. 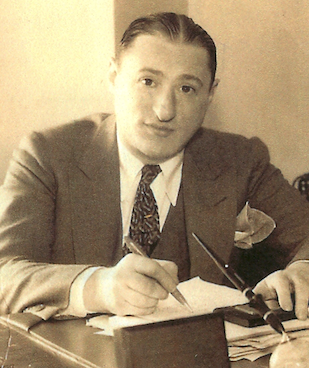 Walter Ruby at his desk in the 1930s. Walter Rabinowitz had been raised in the traditional ways of his Russian immigrant family in New York City's Jewish Harlem, the youngest of nine children. But he felt an urge to assimilate into the mainstream of American culture. He qualified to attend a prestigious high school, Dewitt Clinton, but could not afford to pursue college. That would not hinder his ambition, though. Unlike his older brothers who had gone into the heavily Jewish garment trade, Walter was preparing himself for a career in sales. He was shaping his identity as a second-generation Jewish American. Walter first worked in an office job after finishing school in 1910, but found his true talent in his gift of gab. He was a natural salesman. 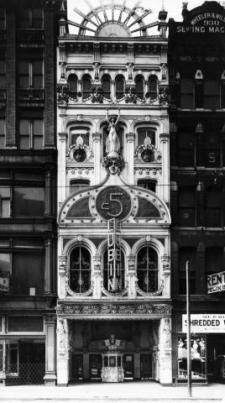 Within a few years, he began his career with the Lenox Novelty Co., a downtown Manhattan maker of wooden jewelry and silver-service cases and other custom wooden designs. 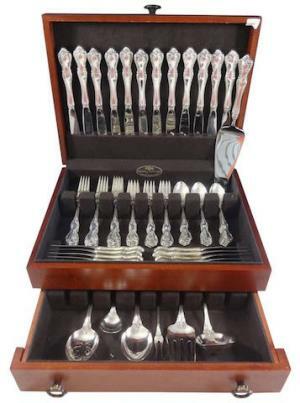 Walter represented the company's products to the many independent silversmiths in upstate New York and New England. When in town, Walter would have enjoyed spending some of his money going out on the town. Nickelodeon theaters were a popular form of entertainment. Some of the more prominent Nickelodeons did more than screen films; live performers entertained between shows. In 1912, a fresh new act, Ruby and Edwards, was playing at the most popular Nick in the Bronx. It was actually just two guys named Harry, a piano player and male vocalist, performing hit songs while the lyrics projected on the screen. Typical Nickelodeon architecture in 1910. One can picture Walter taking notice of the intermission performer, the debonaire piano player about his own age. He was named Harry Rubinstein but called himself Ruby. The other Harry—"Edwards" in the act—was Harry Cohn, who went on to found Columbia Pictures. Harry Ruby's local celebrity grew, and by 1917 he was on the cusp of a storied career as a popular songwriter and motion picture composer. 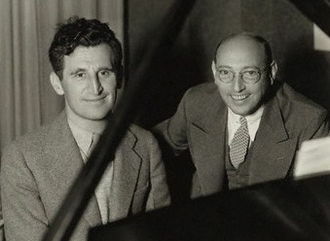 Harry Ruby (left) with lyricist partner Bert Kalmar in the 1930s. By this time, Walter may have already begun using the Ruby name in certain situations, but would not do so officially while his father was living. It would have been as if he was renouncing his family history and values. 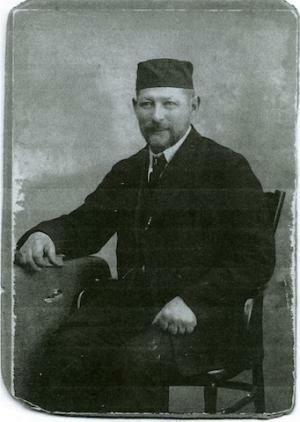 In March 1917, Joseph Rabinowitz passed away at age 62. It was a sorrowful time for the family, but it was also the opportunity Walter had been waiting for. Now he could reinvent himself with a fully American identity that had nothing to do with Russia and religious ritual. In that spring of 1917, America was on the verge of entering into the First World War. On April 6, the U.S. dropped its neutrality policy and declared war on Germany. In May, Congress passed the Selective Service Act with the intent to raise a million-man Army to send to Europe. 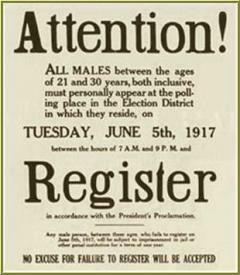 Then, on June 5, 1917, all male citizens between the ages of 21 and 30 were required to register for the draft, making them eligible for later entrance to the military. Walter was in Boston on June 5, either on business or as a short-term resident, and he reported to the local draft board. The name he gave on that day—three months after Joseph’s death—was Walter Ruby Rabinowitz. Soon enough, he would make it even simpler. 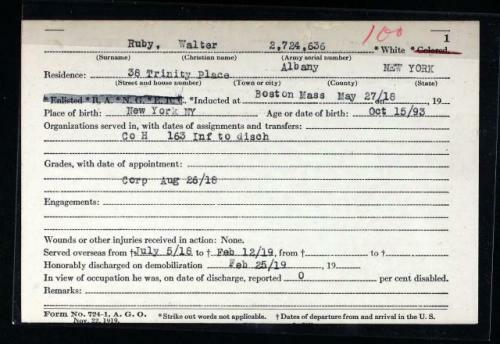 Walter's WWI draft registration on July 5, 1917 was his first official use of the Ruby name. The other big news for Walter in 1917 is he had met a girl, a vivacious 18-year-old from a Russian-Jewish family in Albany. It may not have been unusual for him to strike up romances in different cities on his salesman’s rounds, but this one was different. Selma Ratner was no floozy, but a charming and witty, well-bred young lady. They met when Walter was invited to the Ratner home in Albany. She was both lovely to look at and projected a modern style of Jewishness that appealed to him. Walter called on Selma again when next in Albany. When he came a third time, Abe and Rose Ratner tried to slow down the romance. But the impetuous young couple decided otherwise, running off to Chicago to be secretly married. It was said they stayed in the Palmer House on their wedding night. No marriage record has turned up yet, so we don't know the date of their union. It was very likely before the end of 1917, because we know she became pregnant sometime during the last weeks of December. 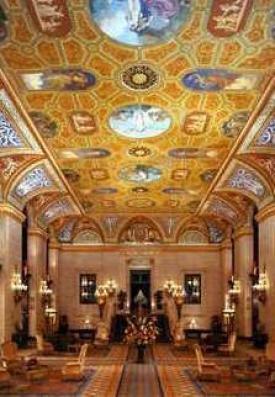 Historic lobby of Chicago's Palmer House. Why would Walter and Selma elope to Chicago instead of involving their families in a joyous Jewish wedding? Maybe the Ratner parents didn’t approve of the liaison. Maybe Walter thought he could defer military service by taking a wife. Or was it that Selma was pregnant? This was not the first elopement in the Ratner household. In October 1916, Selma's brother George, called Peyser, had run off to Detroit to marry a non-Jewish wife. Peyser never fully reconciled with his father, but Selma and Walter later did. That leads to the interpretation that Selma's elopement probably preceded the pregnancy. However, the surprise marriage in Chicago might have happened anytime up until mid-May of 1918. On May 27, 1918, Walter was inducted into the U.S. Army in Boston. Though he was married, Selma was not considered dependent since she could rely on her parents or own earning power. Walter did not receive a deferment. He had a few weeks of basic training and shipped out for Europe on July 5, 1918. He served in Company H of the 163rd Infantry. His war experiences are another story that will be covered here. 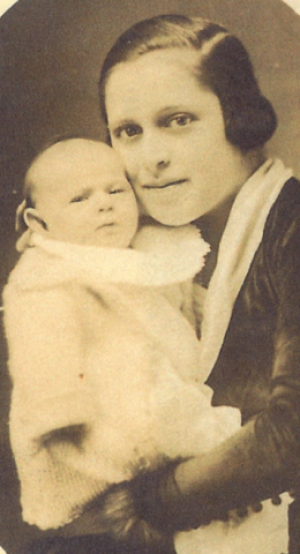 Selma Ruby gave birth to a daughter Joan on September 28, 1918 in Albany. One imagines Walter, maybe in a trench, receiving the happy news weeks later via military mail. He would have passed out cigars if he had them. The fighting was brutal but the tide turned quickly. The Armistice of November 11, 1918, ended the war. Walter returned home from overseas on February 12, 1919, and two weeks later was discharged from the Army. He was back in Albany with his wife and daughter, ready to start life anew openly under his chosen name. Walter went on to considerable adventures in the 1920s and ‘30s that are described here, here and here. None of those would have happened in the same way had he not first reimagined his identity as an American Jew during his transformational years of 1917 and 1918. One later episode is relevant to mention. Sometime in the mid-1930s, Walter and Selma are entertaining in the grand living room of their elegant suburban New York home. According to the memory of Walter’s niece Sandy Brenner, sitting at the baby grand piano and entertaining the guests was the famous songwriter Harry Ruby. The account is not verified but it is not a stretch to think that Walter Ruby cultivated a relationship with Harry Ruby and possibly gave him credit as the inspiration for his own name. Harry Ruby had derived his assumed name from his birth name, which was Rubinstein not Rabinowitz. Other notable Rabinowitz name-changers have preferred to become Robbins, such as famous choreographer Jerome Robbins. Two children of Walter’s brother Julius chose the name Robbins. On the other hand, one of Walter’s sisters, Blossom Rabinowitz, became Blossom Ruby in the 1920s before she married and took her husband’s name. 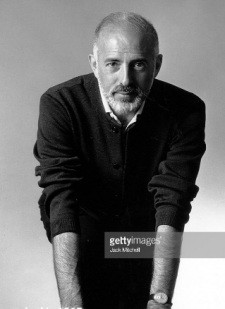 Choreographer Jerome Robbins is not related. When weighing his decision, Walter might also have considered the gemological meaning of the word. Ruby is not an exclusively Jewish name, but there are plenty of Jewish Rubys. It is consistent with other Jewish surnames evoking precious stones and metals—Diamond, Pearl, Saphire, Gold and Silver. We know that Walter admired luxury accoutrements. 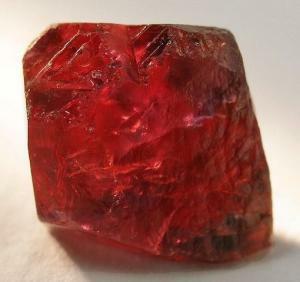 He may have felt that the association with the rich, red mineral to be a positive one. Whenever I meet someone and am asked if I'm related to this or that Ruby (usually an infamous one who is covered here), I can immediately answer "no." Joan Ruby married and her three children grew up as Felensteins. 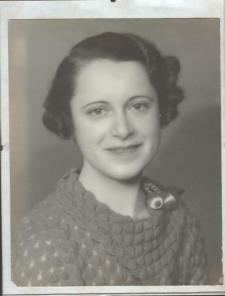 Her younger brother Stanley Ruby married Helga Ringel and they had three children including me. Our generation produced four grandchildren. My sister Joanne uses her original Ruby surname. Her son Zachary Rehm takes his father Bill’s last name and her daughter Elana sometimes melds the names as Ruby-Rehm. My daughter Twyla goes by Ruby and also sometimes uses her mother’s surname Eilertsen. If she marries, she may use another name. The best hope for extending the Ruby name for another generation is probably through Eugene Ruby, the son of my brother Walter Ruby (the younger) and his former wife Lyudmila Ilishaev (of Persian Jewish ancestry). Gene is also unmarried and so far without children, but maybe he will be the one to carry his great-grandfather’s vision into the future. 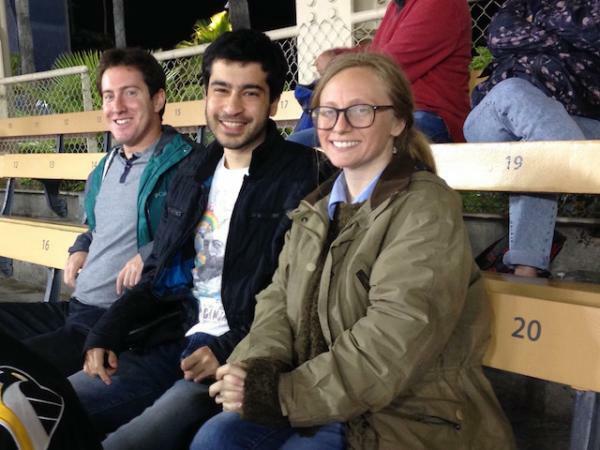 One hundred years after Walter Rabinowitz registered for the WWI draft, three of his great-grandchildren—Zach, Gene and Twyla—took in a ballgame at Dodger Stadium in June 2017.